The Small Business Administration was established as an independent agency of the federal government that aids new business startups and then helps the business grow. Learn about their wide variety of assistance programs! The Small Business Administration will celebrate its sixtieth anniversary in July. It was established as an independent agency of the federal government to help start new businesses and provide tools to help them grow. It accomplishes its mission through direct action to counsel, aid, assist and protect small business interests. It has formed partnerships with many public and private organizations, and maintains an extensive network of field offices to deliver its services throughout the United States. The SBA has a wide array of assistance programs that focus on the four primary functions outlined below. The SBA does not loan money directly, but establishes guidelines for loans with partner institutions that are guaranteed by the federal government. As a general rule, the SBA only backs such loans if a business is unable to obtain other financing on reasonable terms. Applying for an SBA loan is similar to applying for a standard commercial loan except there’s no risk to the lender. Loan requirements may change as federal priorities and fiscal policies are adjusted to deal with current economic conditions. The SBA has a program to guarantee surety bonds for businesses that can’t get them through normal commercial channels. A surety is someone who assumes responsibility for paying the debt of another. A surety bond is a three-party agreement where the surety assures completion of a project if the contractor is unable to perform successfully. This program guarantees the surety that the SBA will cover a portion of any loss if the contract is breached. This provides an incentive to sureties to provide bonding for contractors, increasing their opportunities to win contracts. The bonds cover bid, performance and payment for contracts up to $5 million. In limited cases, the bonds may cover contracts up to $10 million. The Small Business Investment Company (SBIC) program engages private investment companies to provide venture capital for small businesses. The SBICs have two sources of capital funding: government-licensed private investors and low-cost debt that’s guaranteed by the federal government. SBICs are limited to investing in promising small businesses that qualify based on their need for equity or debt financing. The SBA’s government contracting office has a statutory goal of awarding 23% of federal prime contracts to small businesses. This office establishes goals with departments and agencies to achieve the overall objective of maximizing contract awards for these businesses. It also sponsors outreach programs, training, and subcontracting opportunities. The training includes detailed instructions on how to qualify for government contracts. The SBA is heavily engaged with the Department of Defense and General Services Administration to create set-asides for small businesses in their contracts. In addition, it maintains a national small business database that federal agencies can use to search for companies offering specific products and capabilities. The Central Contractor Registry is a dynamic marketing resource for those seeking qualified small businesses. There’s also a disadvantaged business development program to help businesses compete with non-disadvantaged small businesses on an equal basis. This program has been expanded to include minority-owned and disabled veteran-owned businesses. The Office of Advocacy is an independent voice for small businesses, advancing their views and concerns to all branches of the federal government. Its operations are directed by the chief counsel who is appointed by the president. The office reviews proposed Congressional legislation and its regulatory effect on small businesses. It supplements these reviews with comprehensive research on the small business environment, using the results when testifying before federal and state governmental bodies and legislative committees. Advocacy attorneys seek the input of small business owners and work with federal agencies to determine how to minimize the impact of new laws and regulations. They consider and analyze alternative policies and publish their findings for public comment. They also work with state policymakers to promote regulatory flexibility and cost savings for small businesses. The office publishes a quarterly report with small business performance indicators, small business profiles for all 50 states, and the Small Business Economy report. The SBA counsels and advises small businesses at no charge through personal meetings and via the internet. It also offers low-cost training programs designed to assist aspiring entrepreneurs and businesses that are already up and running. Its training centers are spread throughout the U.S. in over 1,800 locations. These programs provide financial management and technical assistance that are keys to successfully operating any business. The SBA also maintains associations with private organizations such as the Service Corps of Retired Executives, now known as SCORE. This nonprofit is dedicated to helping small businesses get started and grow through its mentorship and education programs. Its membership is comprised of 12,000 volunteers who have business experience in 62 industries across the country. Most services are provided free of charge or offered at a nominal cost. These include personal mentoring, confidential counseling, business newsletters and tools, online webinars, and workshops at 348 local chapters. 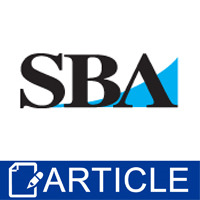 The scope and breadth of SBA programs far exceed the summary contained in this article. Check sba.gov for the latest information regarding ongoing assistance programs and how you might qualify. The SBA is a valuable resource that should be an early stop for startups and entrepreneurs with ideas for new businesses. Their advice and support can help you get your business off the ground and increase your chances of success.